Have you captured amazing moments from a recent trip aboard our vessels? If so, then WE WANT YOU to compete in our upcoming Brochure Photography Contest for 2018! The Beaver Island Boat Company invites photographers to enter its Brochure Photo Contest for our upcoming season. With the chance of the winning photo to be on the front cover of our 2018 brochure! If your photo is chosen to be on the cover of our brochure, you will receive (4) Round Trip Adult Tickets, plus a BIBCO Merchandise Basket. 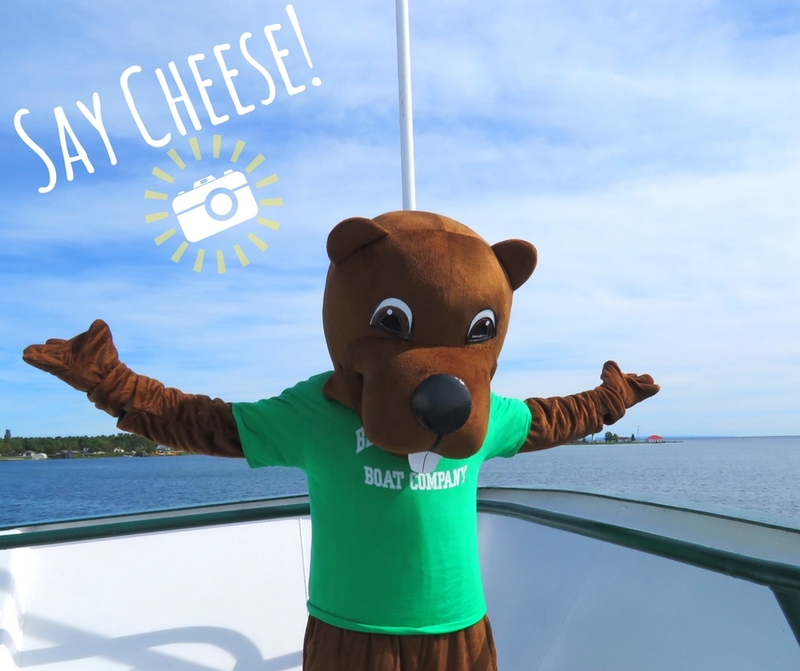 (t-shirt, water bottle, tote and more) If your photo is chosen to be featured inside our brochure you will receive (1) Round Trip Adult Ferry Ticket. (all prizes are to be used for only one customer, ID required). Please be aware that this is a one-time prize for our 2018 season. All images must be submitted via email to: marketing@bibco.com by November 20th, with the preferred subject line “2018 Brochure Photography Contest”. The BIBCO Brochure Photo Contest is open to all photographers at least 18 years of age. Please note that submitted photos will be cropped to fit our brochure front cover and posted to Facebook. A final Beaver Island Boat Company judge panel will choose the top photos to be featured in the brochure and the brochure cover photo if applicable. We are looking for photos featuring our beloved vessels, the Emerald Isle and/or the Beaver Islander. We encourage photos of Beaver Island and its treasured landmarks as well, but please know that only photos featuring our vessels will be eligible to be featured on the front cover. We are especially interested in images that have one or both of our boats and show the beauty of Northern Michigan (spring/summer/fall pictures). If you choose to include people in your submission, you are responsible for obtaining the necessary releases from the individuals depicted, and must be able to provide copies of those releases to BIBCO upon request. If you are submitting more than one photo, please be aware that you are still only eligible for one prize. The photo will be used in a 4” x 9” space on the brochure and will be cropped to fit the brochure before we post to Facebook for the contest. Photographs in Portrait work best since we have to crop the photo less, we will still accept landscape but it will be cropped to fit the brochure cover space. Photographs must be in digital format and in .JPEG format with a preferred 5-megapixel resolution or higher. BIBCO employees and Board members are ineligible to win but can still submit a photo. BIBCO shall determine winner eligibility in its sole and absolute discretion. All decisions made by the judges are final. By submitting an entry, each entrant agrees to the Official Rules and warrants that his or her entry complies with all requirements set out in the Official Rules. Deadline for photo submission will be November 20th. We will post all photos that were submitted and fit requirements on Facebook the following day, along with the photographers name for submitted photo. We will also post the winners on all BIBCO social media accounts prior to the brochure going to print for the 2018 season. By submitting images to BIBCO, you grant BIBCO rights to your photograph to post to Facebook for competition and to be used for our 2018 brochure. You grant BIBCO royalty free license to use, reproduce, modify, publish, distribute and exercise all copyright and publicity rights with respect to those photographic images at its sole discretion. This includes incorporating it in other works in any media now or later developed. BIBCO reserves the right to not use the winning photo for the brochure front, but may use it in other advertising. Please note that we “re-share” photos submitted on our social media sites through out the following year. BIBCO is not responsible for others sharing your photo without credit, should you wish to receive credit in all forms we recommend placing a subtle watermark on any images submitted that may be shared. Entrants warrant they own all rights to the photo they are submitting. Entrants will indemnify and hold BIBCO and its affiliates harmless from and against any and all loss, damage, costs and other expense arising out of claims, whatever their nature, resulting directly or indirectly from breach of this warranty.